Google+ offer you a badge that helps your visitors to add or circle you right from your website. The functionality is much similar to Facebook subscribe and Twitter follow buttons. But it doesn't show off any of your circle counts. However its appearance originated from Google+ page badges and you need more space to implement this badge. And now you don't need to specify a Google+ profile link for your readers to navigate and add you to their circles. They can just add you via this profile badge without leaving your site. Interesting? Let's see how to implement it on your website. 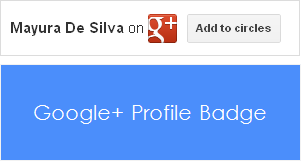 If you looking forward to add Google+ profile badge, you should have a Google+ account for yourself. Create a new Google+ account if you are not a Google+ member. 2. Now add below Google+ script before the </body> tag. * If you have already implemented Google +1 button on your website, you don't need to add this script again. * If you are a Blogger user and don't know how to edit your template, read How to Edit Your Blogger Template. 3. Sign in and navigate to your Google+ profile. 4. Now grab your profile URL displayed on your web browser address bar and keep it to use in next step. 5. Now implement your Google+ profile badge, either using Google+ Badge Tag or HTML5 valid Badge Tag. Add your preferred badge code snippet where you wanna render it. Specify your Google+ profile URL here. Specify the width of the badge in pixels. You can change color theme of badge here. Use value light for lighter color badge or dark for dark color badge. I think you are trying to add Google+ page badge. Else it shows I'm on instead of We're on. However on page badge, it shows We're on 'cause your name is bit long and doesn't fit to width of your badge. So you just have to increase width of your badge :) If you are referring to page badge, read Add Google+ Badge to Your Website.